Google has been investing big time in not just becoming an energy-efficient company, but also working on technologies that can create renewable energy. In this Google blog post, Google’s Senior Vice President, Technical Infrastructure, Urs Hölzle declares that Google is set to reach 100% renewable energy consumption as early as 2017. He also says that the Google data centres are anyway 50% more energy efficient than the industry average. 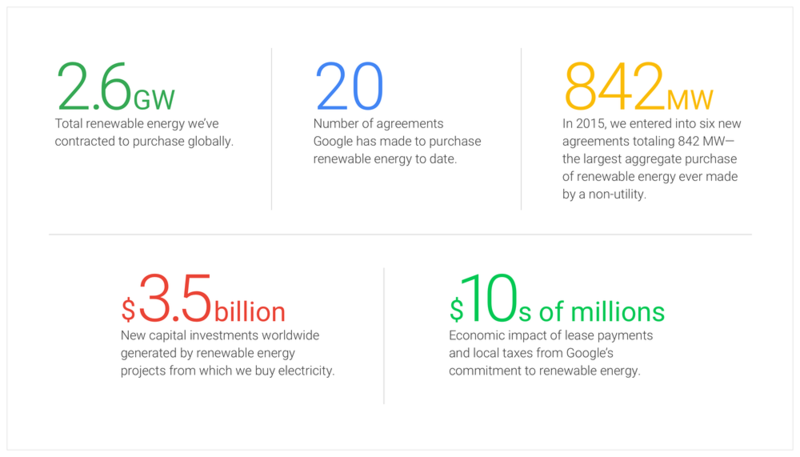 Google is the world’s biggest corporate buyer of renewable energy. 44% of its power needs are met by solar and wind energy. Switching to renewable energy also makes business sense. Most of the operating cost in various Google data centres goes towards its energy needs and over the past six years the cost of wind and solar energy have come down to 60% and 80% respectively. Google also has a dedicated website on how it tries to make a positive impact on environment and also create self-sustaining communities around renewable energy projects.